The British Bouldering Championships come around every year and every year I sign up with a mixture of psyche, hope and dread. For some reason it feels more nerve wracking than a World Cup! Perhaps this is because it is a home crowd, perhaps I feel expectations are higher in a smaller field or perhaps it is just a competition that I always want to do well in but have a history of performing distinctly averagely in! In fact my best performance (prior to this year) was my first in 2008 where I placed 3rd; since then I have never been on the podium and it has a history of knocking my confidence. Whatever the reasons behind my trepidation, the BBCs arrived again this year and it was time to get psyched up to try hard. The field in UK women’s bouldering is strong at the moment with world class climber Shauna Coxsey; strong, gymnastic climber Leah Crane; and of course our adopted Brit, the power house, Alex Puccio. The weekend was a hot one and it was going to be tough. With a new format that follows that of a World Cup, we embarked on qualifiers, semi-finals and then finals. 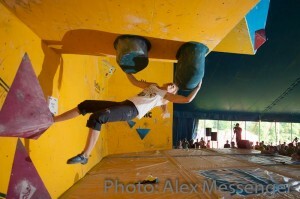 For the women’s finals it came down to the aforementioned three, Jennifer Wood, Gill Peet and myself. There was a great crowd and a fun atmosphere and I was psyched to try hard. To cut a long story short, the final was totally owned by Shauna. 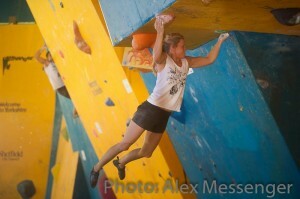 She flashed all 4 blocs and deservedly came 1st. 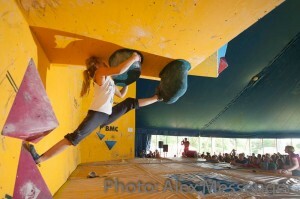 I managed 2 blocs (I am ashamed to admit the use of my fingernails on the slab!) as did Alex and Leah. It came down to attempts and, to my surprise, I came through in 2nd. My best result ever! 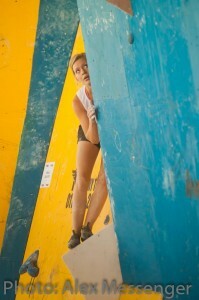 It was an odd feeling actually because I didn’t feel like I actually climbed very well in that final…. one of the blocs I couldn’t even get off the floor! But I suppose that is how it goes sometimes! 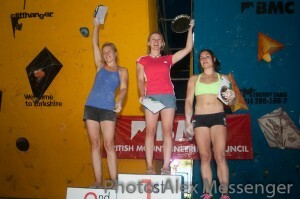 Having said that, after trying really hard in the World Cup season, I felt I earned my position of number 2 in British women’s competition bouldering and so it was nice to have that reflected in the results of our nationals. As I write this I am killing time at Heathrow Airport before getting on a flight to Vancouver for the Squamish Mountain Festival. Really excited to climb in Squamish and to give my first ever lecture for Arc’teryx as a pro climber…..eek! Pretty terrified to be honest. 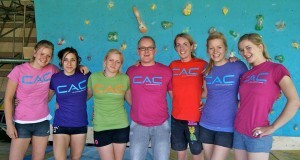 If you don’t already have a CAC T-shirt…..